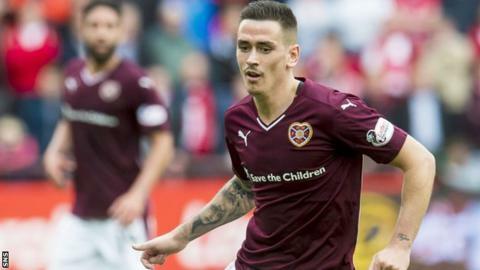 Hearts winger Jamie Walker hopes shockwave treatment will rectify a knee problem and help him back to action. The former Under 21 international has been out for a month and is still unsure when he will be fit to return. Walker hopes to be back sooner rather than later, and wants to catch the eye of Scotland manager Gordon Strachan. "I've been getting a course of shockwave therapy and the knee is healing quite well and hopefully l'll be back playing soon," he said. Walker admits knee injuries have been a source of frustration for him in the past, his latest setback coming in the League Cup tie against Celtic on 28 October . "I've always had problems with my knees and I just took a knock against Celtic in the cup which made it flare up. It's a pain that come and goes. "Now I'm letting it heal properly and hopefully it won't affect me as much." "The doctors use this bit of equipment which just looks like a big gun. It shoots shock waves into the knee and hopefully breaks up tissue and helps it heal quicker. "I've had that course and I'm feeling a lot better and I'm looking forward to getting back." Despite his ailments Walker's form has been impressive in the early part of this season. It brought calls for him to be considered for the Scotland squad and that is an ambition he hopes to fulfil. "As a player you want to play at the highest level and for me, that's representing my country," Walker explained. "I'm obviously still injured now so I just want to get back playing well for Hearts first. "But after that, you never know what could happen and whose eye you might catch. "It would be up to what Gordon Strachan thinks, but I'll just keep that aim in the back of my mind and just concentrate on getting fit and playing well. "I had a good season last year and carried that into this campaign, so it's frustrating. But you just have to try your best to keep your head up while working hard in rehabilitation to get back fit."